Course tickets allow your customer to book every event you have created in an entry with just one ticket. They are useful if you are planning a multiple event programme with linked content/activities, or if you simply wish to give your customers the option of participating in each event with a discount. Select the Ticket you would like to change to a course ticket, or add another ticket type. You should make sure that the cost of booking is reflective of the fact that the ticket is for a series of events so that you receive the full payment you are expecting for the entire series. After selecting Course ticket you are given the option to discount past events, whichever amount you enter here will be deducted from the ticket for each event which has already passed at the time of booking. For instance - With a course ticket of 5 events for £50 and a Discount on past events of £8, a customer purchasing after 2 of the events have already passed will pay £34 (£50 - £8 - £8 = £34). More information in our support article on pro-rating course tickets. 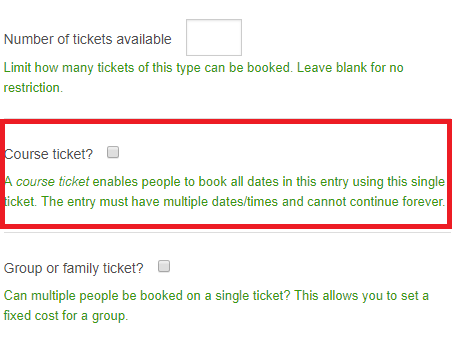 If there is both a course ticket and a single date ticket available for your event (set up in tickets & costs on the event entry) then the course will be visible on your schedule on every date of the entry. If the course ticket is the only ticket available on the entry then the course will only be visible on the schedule page on the next upcoming date of the course (if the date isn't in the past) or the first date of the course (if all course dates have passed). An entry must have more than one event for a course ticket to be created. If you're getting an error, untick the course ticket box, click 'Save', tick the course ticket box again and click 'Save'.